Posted on Tue, Feb 28, 2012 : 2:12 p.m.
Washtenaw County sheriff's deputies are investigating two burglaries reported Monday at businesses on Jackson Road in Scio Township. Employees from both Coffee House Creamery and Main Dish Kitchen called police after discovering the businesses had been broken into. It's not clear whether the break-ins are related. A burglary was reported at Main Dish Kitchen Monday. Coffee House Creamery manager Jamie Valliere said she discovered the glass front door was shattered when she arrived at the shop, 3780 Jackson Road, before 6:30 a.m. Monday. She said she immediately got back in her car, drove to the other side of the parking lot, near the Quality 16 Movie Theater, and called police. "I was scared. ... I didn't know if anyone was still in the building," she said. Sheriff's deputies arrived within 10 minutes, she said. Talus Park, whose wife, Natalie, owns the shop, said some cash and equipment was taken. Investigators believe the break-in occurred overnight, while the business was closed. Sheriff's office spokesman Derrick Jackson was not immediately reached for comment Tuesday. 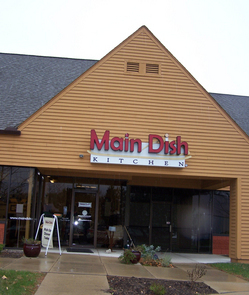 At Main Dish Kitchen, 5060 Jackson Road, employees called police Monday after discovering the business, which creates dinners for busy families, had been burglarized. It was not clear whether anything was taken. No suspects have been identified in either break-in, and the investigation will continue. The coffee shop is up and running like normal Tuesday after reopening just before lunchtime on Monday. Valliere is not sure what new precautions they'll take in the future, although she said they've already talked to mangers at the movie theater about keeping an eye out late at night as a first step. Customers keep coming in as word about the burglary spreads, Valliere said, adding that a woman came in Tuesday afternoon to buy her friend lunch after hearing about the burglary. "It's a big loss considering how small we are," she said. Park said one of the regular customers even helped clean up the broken glass from the front door on Monday. The outpouring of support from the community has been overwhelming, he said. "Unfortunately, there's elements like that in our community, and but no matter what we have to keep going," Park said. Contact Julie Baker at juliebaker@annarbor.com or 734-623-2576. Follow her on Twitter @juliebakera2. Wed, Feb 29, 2012 : 6:33 a.m. I have not been to either of these, the coffee house or the main dish kitchen. I doubt that it was someone local. It really is sad that someone could do this to a small business. I do hope the suspect/suspects are caught soon. Wed, Feb 29, 2012 : 3:15 a.m. This is very sad. Anytime a business is burglarized it's terrible, but I can't help but feel even worse when it's a locally owned business. I've never been to Main Dish but frequently go to Coffee House Creamery. Natalie and her staff are always so friendly and pleasant, not to mention the good beverages and food. I hope they both recover quickly from this, and the person or people responsible are apprehended quickly. Tue, Feb 28, 2012 : 9 p.m. This is sad news, not just for this part of the Scio Community, but especially for these small businesses. Friends and I are frequent visitors to the Coffee House Creamery and I can tell you that the owners and all the staff work hard to make that little business thrive and be an asset to the business community along Jackson. The same goes for Main Dish Kitchen, which helps more than one small business make a go of it. Wed, Feb 29, 2012 : 2:51 p.m. It doesn't make any differance if it is a small business or a large one stealing is wrong. It just hurts the small businesses more than a large one. The larger stores just up their prices to cover the losses which makes everyone pay more. Tue, Feb 28, 2012 : 8:44 p.m.
o overnight while the businesses were closed. excellent investigating investigators. Tue, Feb 28, 2012 : 9:10 p.m.
Tue, Feb 28, 2012 : 8:34 p.m.
Really, this is a shame. These are small businesses run by extremely hard-working regular folks, and I doubt that there would even be that much cash on hand for these losers to steal. They are actually hurting the whole community, and I hope that if anyone has any info on this, they do the right thing and share it with the authorities. I like J's idea of making the perp meet the owners face to face. Unlike some companies, these small businesses really ARE people. Tue, Feb 28, 2012 : 8:10 p.m.